Tonight I am writing post number 2000 for Braman’s Wanderings. I have been watching my stats page and seeing the number of posts slowly approach this milestone. Before I started writing my post tonight it showed 1,999 posts. The blog began back in May of 2012 and I have been writing ever since. Above you see a screen shot of my first blog post (Welcome to Braman’s Wanderings). It was a short post with no pictures. However, I believe that I have followed what I set out for in the first post. You may notice that I mentioned “We will see how often it gets updated”. I think I have done a good job in making regular posts. The only large gaps have been on a couple trips to China when I couldn’t access WordPress to post. Since I have started posting I have had a little over 343 thousand views on the blog. This does not count people who read the posts in e-mails or blog readers that do not return stats. It is a much larger number than I would have expected more than five years ago when I started. I also have almost 1,000 followers. I know that many of these rarely visit the blog, but it is amazing that so many people have clicked follow for some reason or another. OK, this is not the full list of the 25 most visited posts, but you can see the entire list by clicking on Popular Posts. You will also see a list of least visited posts. The most popular post is one that I wrote about the Walls of Jericho. 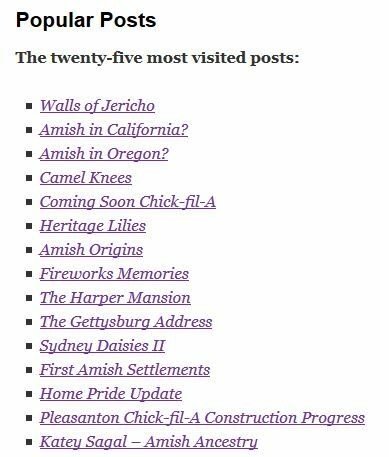 The second most popular is Amish in California? Both of these have been visited more than 10,000 times. The next two have been visited more than 5,000 times and the rest in the list above more than 1,000 times. I want to say thank you to all my readers and followers for keeping me motivated to share my wanderings. Now on to the next 1000! This entry was posted in Blog, Culture, Memories and tagged Amish, Blog Stats, followers, Milestone, Most visited, Walls of Jericho, Wanderings. Bookmark the permalink. I’ve enjoyed many of your wanderings.